Hear ye, hear ye! 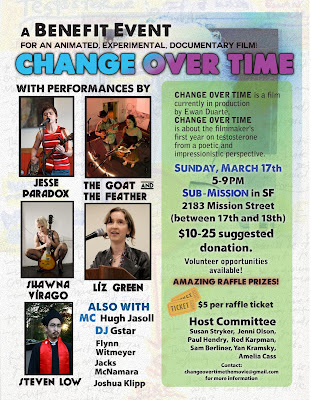 I'll be performing at an upcoming benefit for filmmaker and friend Ewan Duarte's new film, CHANGE OVER TIME! CHANGE OVER TIME is a film currently in production by EWAN DUARTE. from a poetic and impressionistic perspective. The BENEFIT EVENT is a fundraiser for CHANGE OVER TIME! DJ GSTAR will start spinning at 5PM sharp! Joshua Klipp is one of the dancers! There are volunteer opportunities available! CHANGE OVER TIME is fiscally sponsored by the San Francisco Film Society! and more raffle prizes to come!